So, on that sticky, hot summer night, we went down in the country to hear one of the 20th century’s greatest gospel preachers. When we entered the little country church building, I saw this small framed man, with curly black hair combed straight back. He had black-rimmed glasses. He was wearing a white suit, with white shoes. Not a wrinkle could be found in his polished appearance. When the service began, the building was packed with people. The songs were sung, the prayers were prayed, and the invitation song was announced, then the man in white took to the podium. He began his sermon as many do, soft-toned, kind and gentle. Not a time did he look at a note, but with exactness and clarity, he proceeded to preach the gospel of Jesus. It was not long before his passion for the message was felt by all in the attendance. His voice got louder, and more convicting with every quotation of passage upon passage of Scripture. That man of God preached on the level of such intensity, that at times his face turned blood red. Contrasted with the white suit he wore, the awe-inspired audience in that little country church in North Alabama, sat without so much as a blink of the eye for over an hour. What a preacher! What passion! What a Savior he proclaimed! V.P. Black was born in Lamar County, Alabama, December 15, 1918. He passed from this life February 4, 2007 in Montgomery, Alabama. He was eight-eight years old. He is survived by his wife Lourine Tennison Black, two children, four grandchildren, and six great-grandchildren. He was an educated man. He attended Freed-Hardeman University for two years. He received his B.A. from Faulkner University. He held two honorary doctorate degrees, the LL.D. degree from F-HU, and the other from Southeastern University. Though honorary degrees, one could never argue that they were not earned, as for seventy years he faithfully preached the gospel of Christ. No man worked harder for Christian education than did V.P. Black. He served more than 20 years as the Vice-President of Faulkner University (formerly, Alabama Christian College.) He set up a $100,000 ministerial fund at F-HU to help prepare gospel preachers. He gave over $100,000 to Faulkner University from the sales of his books. He served on the Board of Directors of Faulkner University and the board of Namwianga Christian School in Zambia, Africa. He personally gave thousands of dollars to this African school to underwrite the educations of hundreds of Gospel preachers. As a preacher, none surpassed his dedication. He served in local work for over 25 years in the city of Mobile, Alabama, and in gospel meeting work he preached over 45 years. His greatest contribution to churches of Christ was in the area of teaching on stewardship. His teaching was challenging, and Biblical, often receiving strong criticism from weak brethren. But, no one lived his preaching any more evidently that did V.P. Black. Only the Lord knows of the thousands and thousands of dollars that he and sister Black have given to the Lord’s work, especially in the area of training Christian preachers and teachers. The greatest sermon I ever heard from any preacher, was at the Freed-Hardeman University Lectures on February 9, 1993. Each year the Lectureship is dedicated to the life-work of great church leaders. That year V.P. Black was honored. After attending the Appreciation Dinner for brother Black, which in itself was an event of honor equivalent to that of kings, this humble giant of a preacher stood before thousands that night and preached a sermon entitled, “Behold, The Christ.” For 42 minutes we sat entranced and enthralled as that, then seventy-four year old, man proclaimed with spectacular acumen, the beauty of the Christ we serve! You can download and hear that sermon here. I shall never forget this great man who touched my life, and that of my family through personal friendship and love. He was a dear friend to others in our church family here at Buford, especially to David and Carolyn Wheeler. For years David traveled with Brother Black for gospel meeting work, when David served as his personal song leader. Others have had Brother Black into their homes, and for years held him in highest esteem. He will be greatly missed. A great man has fallen in Israel! It has been my privilege through the years to hear some of the outstanding preachers in our brotherhood—N. B. Hardeman, G. C. Brewer, Foy E. Wallace, C. M. Pullias, B. C. Goodpasture and many others—but I do not remember the first time I heard these men. In some cases, I was so young their preaching may not have made any great impression on me. But I remember the very first time I heard V. P. Black. I was visiting with the Shannon Church of Christ in Columbia, South Carolina, during a meeting in which brother Black was preaching. I was thrilled to hear the gospel presented so simply, so lovingly and so powerfully. Since that time I have sought every opportunity to attend meetings and lectureships where V. P. Black was speaking. I have never been disappointed in a sermon or a lecture which brother Black delivered. V. P. Black attended Freed-Hardeman University (when it was still a junior college). He earned his B. A. degree from Faulkner University. He was honored by Freed-Hardeman with a LL. D. He also received the same honorary doctorate from Southeastern University. While the latter two degrees are honorary, they were "earned" by the enormous amount of work brother Black has done in supporting Christian education. Brother Black served as Vice-President of Faulkner University (formerly Alabama Christian College) for more than twenty years. He has raised hundreds of thousands of dollars for Christian schools, including Freed-Hardeman University. He has set up a $100,000 V.P. Black Ministerial Fund at Freed-Hardeman to help prepare young men to preach the gospel. He has given over $100,000 to Faulkner University from the sale of his hard back books. 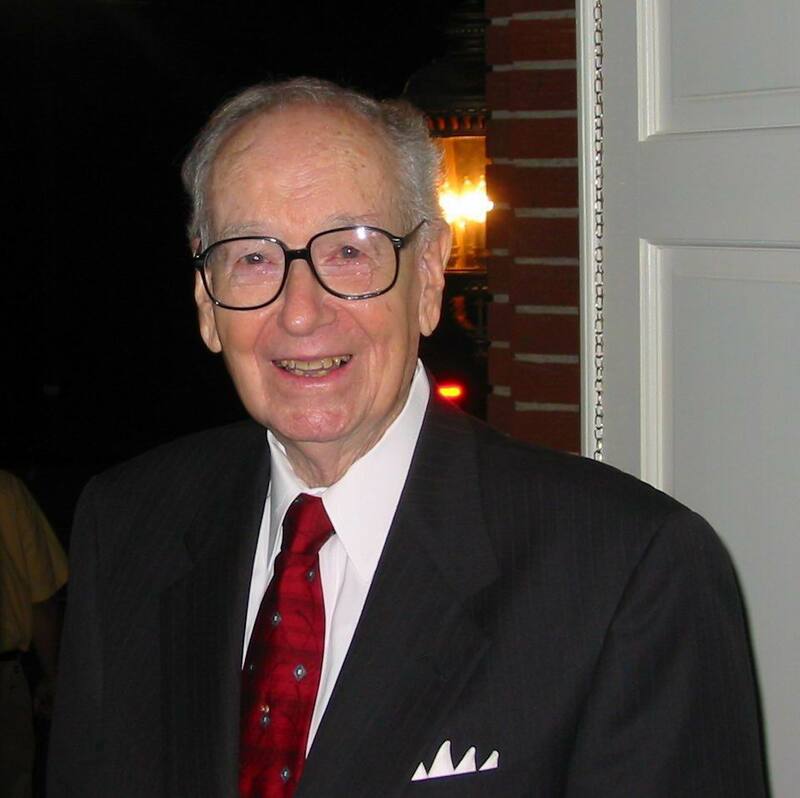 Brother Black served on the Board of Directors of Faulkner University for twenty-five years. He is currently serving on the Board of Directors of the Namwianga Christian School in Zambia, Africa. He has personally given money and helped to raise thousands of dollars to send hundreds of boys to the school in Zambia so that they could study to preach the gospel. V. P. Black has written twelve books, five hard back books of sermons and seven books on stewardship. His writings-like his preaching-are strongly biblically oriented. They are simple in approach hut profound in thought. Brother Black was one of twelve preachers among the churches of Christ to have a book of sermons published in a set of twelve books known as "The Twentieth Century Sermons." I personally have profited tremendously from V. P. Black's published writings. Brother Black worked with the Plateau Church of Christ (now Central) in Mobile, Alabama for forty years (twenty-eight years as their local preacher). During the next twelve years he did evangelistic work under the oversight of the Plateau elders. For the last eight years he has been preaching in meetings all across the United States. He gave up local work more than twenty-two years ago. He now devotes full time to gospel meetings. He averages more than forty-five meetings per year. Virtually everyone among the churches of Christ know of brother Black's work on stewardship. He has probably preached more on that topic than any other modern preacher among the churches of Christ. Through his lectures, sermons and books on stewardship, he has helped to increase giving among our brethren. Sonic have estimated the increase to be as much as $100,000,000. Dr. George S. Benson, former President of Harding University said, "V. P. Black has taught more people to give liberally of their means than any man living." V. P. Black has conducted as many revivals and possibly more than any other preacher among churches of Christ with the exception of Guy N. Woods. He began preaching in meetings at the age of twenty. For thirty-two years he conducted from twelve to fifteen meetings per year. Even during those early years he preached in as many as eighteen to twenty meetings per year. For the past twenty-two years he has been in full time meeting work. In 1965 brother Black preached in a campaign in Mobile, Alabama, where he lives. There were 269 responses during that meeting. Ninety-eight were baptisms. The same year he preached in a campaign in Summerville, Georgia, with 191 responses. In 1966 he preached in a campaign in Anniston, Alabama with 198 responses. He preached in a meeting for his home congregation with fifty-two baptisms. Through the years brother Black has preached in hundreds of meetings with thousands of baptisms. One of the remarkable features of his preaching is that during his fifty-four years of preaching he has never been involved in a church fuss or a church split. He believes if preachers were busy trying to convert people and teaching on unity and brotherly love much of the trouble in the Lord's church would never have gotten started or would cease. Brother Black's influence has been positive and powerful. 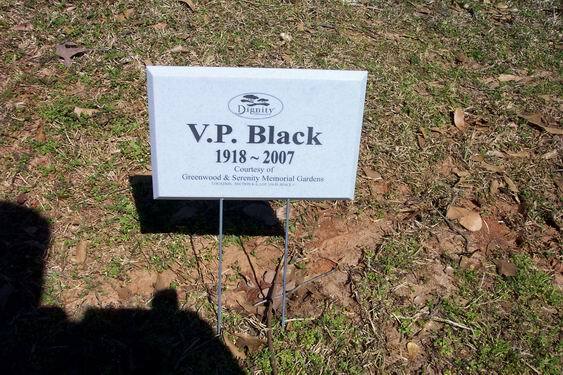 V. P. Black has been honored in many ways. A few years ago the mayor of Chickasaw, Alabama, honored him by having a "V. P. Black Day." As I mentioned earlier, Freed-Hardeman University and Southeastern University bestowed an honorary degree on brother Black. He especially appreciates the Church Service award granted by Freed-Hardeman University. Through the years he has received many plaques and awards from various groups. Brother Black's faithful companion, the former Lourine Tennison, has stood by him through his many years of preaching and lecturing. She is a very gracious Christian lady who has contributed mightily to brother Black's effectiveness in the proclamation of the gospel. The Lectureship Committee of Freed-Hardeman University wants to include her in the banquet we are giving on the Monday night dour lectureship and in the dedication of the Lectureship book. We are grateful to God for the work you both have done in his kingdom; for the great encouragement you have been to thousands of young people through your support of Christian education; and for your great example to all who know you. We thank God upon every remembrance of you and pray his special blessings to be with you both. "Like Whitecaps in a Sea of Blood"
V. P. Black passed from this life on Sunday morning, February 4, 2007. This giant of the faith was well known and well liked by many people, both in and out of the church of Christ. Brother Black was certainly a friend of the Florida School of Preaching. He was a regular speaker on our annual lectureship from its inception in 1975 until 2004, when, at his request, he appeared for the last time. Fittingly, his topics that year were "How We Are Saved by Grace" and "When I See the Cross." Our 1995 book was also dedicated to him. V. P. Black left an impression on me from the very first time I heard him as a student at the Florida School of Preaching. During that time, I heard him preach several sermons where he described the suffering of Christ. An expression, still ringing in my ears, that sums up the articulate influence of brother Black is his description of the scourging Jesus endured. He declared that Jesus was beat so badly that His shoulder blades protruded "like whitecaps in a sea of blood." I had never heard the name V. P. Black until the first lectureship I experienced as a student at the Florida School of Preaching in 1990. He has probably impacted my mannerisms in preaching more than any other single person. Here was a man—completely unknown to me at the time—who was not of great physical stature, yet he powerfully preached the word of God. He was a man who did not tout a host of academic degrees, yet he was eloquent and educated enough so that he could reach an assembly consisting of people from any educational level. He was a man who was serious about preaching and living the truth, yet he had a tremendous sense of humor from which he could unmistakably teach aspects of the unsearchable riches of Christ. He was a man of seemingly average means, yet he was so generous toward Christian education in general and preacher training in particular that he had probably raised and donated more funds to help our brotherhood schools than just about anyone living at the time of his death. The lesson to which I am indebted to V. P. Black was learned from the first couple times I heard him preach in 1990. This twofold lesson changed my life as a preacher. Through his preaching, V. P. Black taught me to be myself in preaching and to let the Bible do my speaking. Like many young men attending preaching school for the first time, I was searching for identity. That search can lead young men to two extremes. One extreme is that they imitate their favorite preacher to the point of taking on his mannerisms in the pulpit. For example, I have heard that in the days of N. B. Hardeman's prime, young men would preach with one hand in their coat pocket as brother Hardeman often did. The other extreme is that young men become so timid and lacking in confidence that they lose their effectiveness in the pulpit. V. P. Black's example neutralized those extremes. "Like whitecaps in a sea of blood" inspired me to be myself in preaching. As stated earlier, V. P. Black was an unknown to me, yet once I heard him preach, I could never forget him. The reason why is clear: he was completely himself. Some preachers have a totally different demeanor when they preach, almost as if they are acting, but not brother Black. He was genuinely himself, a truly Christian gentleman who loved the Lord, whether in the pulpit or not. The only difference I could tell while he was in the pulpit was the volume of his voice and the urgency with which he pleaded. We do not have to mimic others when preaching. We are much more effective when we, like V. P. Black, truly love the Lord and are genuinely ourselves, whether in the pulpit or not. "Like whitecaps in a sea of blood" also motivated me to learn as much about the Bible as I could so that it could speak for me while preaching. V. P. Black was very knowledgeable in a number of areas, the chief of which was the Bible. He could, for example, relate parts of Shakespeare to people today and how the Gospel could take care of that particular problem with humanity. He could also refer to something that happened in American history to a Biblical principle that would, for example, lead one to Christ. This showed that he was well learned not only in humanity, but even more importantly, in the word of God. He could keep an assembly spellbound, not by fabulous Power Point presentations, but by simply preaching "Jesus Christ, and him crucified" (1 Cor. 2:2). Nobody hearing me preach today would probably ever think that V. P. Black had such an influence on me. Other than the "book, chapter, and verse" style of preaching that so characterized brother Black's sermons, my manner of preaching is not much like his. I certainly do not have the knowledge that brother Black possessed, either in the secular fields or in the Bible. I do not have the same posture of brother Black and certainly not the vocal eloquence. One thing I do have, however, is extreme confidence in preaching God's word, thanks to the articulate influence of a physically average man from South Alabama who was spiritually mighty because he gave his life and talents to preaching the Gospel of Christ! V. P. Black is perhaps best known for his lessons on giving and stewardship. His three books, Rust as a Witness, Giving Our Way to Prosperity, and My God and My Money, were well known and studied. However, when I think of V. P. Black, there is still one theme that rings loud and clear, summarized by the words, "like whitecaps in a sea of blood." -Written and contributed to TheRestorationMovement.com by Brian R. Kenyon, Florida School of Preaching, Lakeland, Florida, on 04.05.2011. Thanks to Brian for this particular piece that speaks about the illustrious and passionate preaching of V.P. Black. I, too, have heard the phraeology mentioned in this article, among many colorful phrases that Brother Black used to describe the Lord whom he greatly loved. My, how he enthralled us with his pictures of the Savior! V.P. 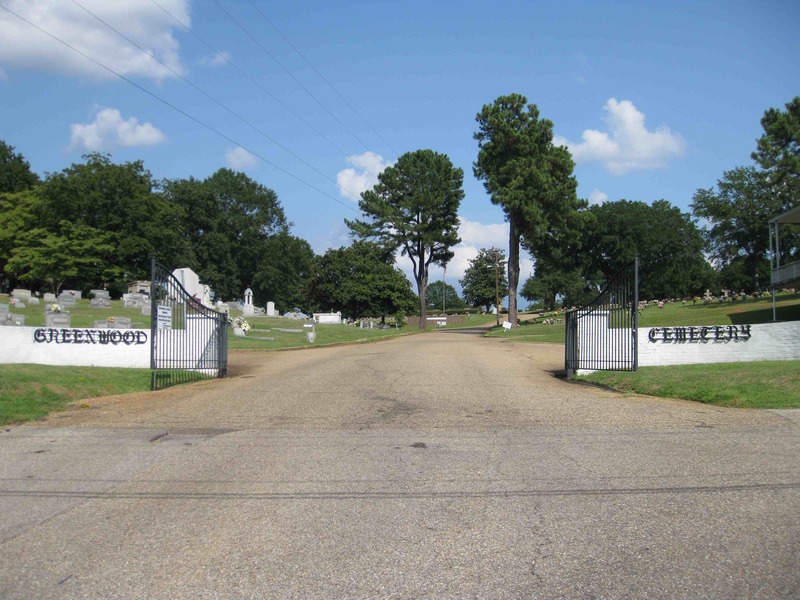 Black was buried in the Greenwood Cemetery in Montgomery, Alabama. 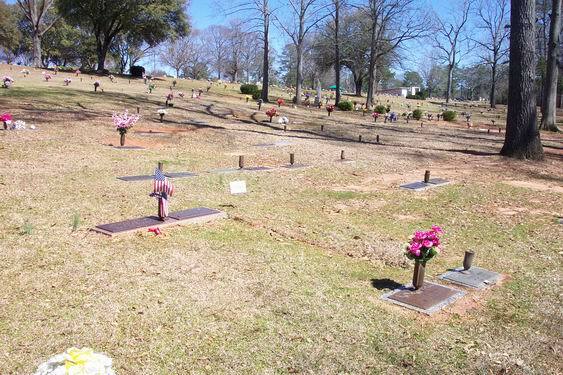 Besides being the final resting place for many of Alabama's great historical figures included Governors George Wallace and Lurlene B. Wallace; many gospel preachers are now buried there as well. Just east of central Montgomery, take I-85 to Exit 3, Ann St. Exit, and go north. Go five streets to Highland and turn right. Go to the stop sign and you will be facing the entrance to Greenwood Cemetery. Enter the cemetery and go to the top of the hill. As you go up the hill note the section to the right with three crosses in the middle. When topping the hill go into the circle where the grave of the late former Governor and politician of the mid-20th century, George C. Wallace is buried. Take the first right and begin going down the hill (Now the three crosses on on your right). Continue to the bottom of the hill, and stop the car. Get out and go into the plot to your left. The plot is about 50' in from the drive. Other preachers of note buried at Greenwood are Rex Turner, Sr., Rex Turner, Jr., J.M. Barnes and Clyde E. Fulmer.